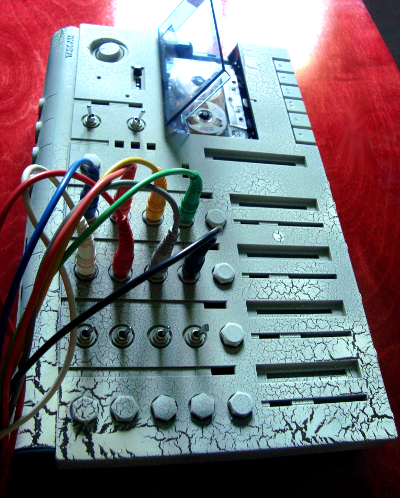 The Tascam 414 is the all time favourite four track cassette tape recorder of DIY bands the world over. Many albums have been recorded on such machines and they all have a distinctive low-fi quality imparted by the electronics in this machine. For those who desire a slightly less low-fi sound with more detail and dynamics, lower noise and tons of character, Jesus Agnew has extensively modified this machine by entirely removing the built-in mixer electronics and adding direct inputs and outputs to the tape recording and reproduction electronics. This machine can now be used with our high quality vacuum tube electronics to greatly improve the results that can be obtained from this medium. For those of you nostalgic about the four track cassette tape, we are now able to offer high quality analog stem mastering directly from your four track recordings. This is not just limited to recordings made on the Tascam 414. Four track cassette tapes recorded on any such machine running at 3.75 ips will work just fine. Below you can hear a before/after comparison of an old recording that was worked entirely on the stock Tascam 414 before any modifications were made back in 2011, and the same recording analogly remastered using the modified Tascam and our analog vacuum mastering setup, in 2015.